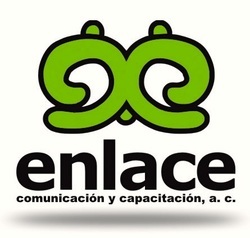 “Enlace” means link or go-between; “cc” refers to comunicación y capacitación, communication and training. IAP means Institución de Asistencia Privada, a form of legal status for non-governmental organizations in Mexico. Enlace creates and strengthens collaboration among small farmer and indigenous organizations committed to sustainable development in central and southern Mexico. It objective is to contribute to the building of a just and sustainable society, rooted in solidarity. 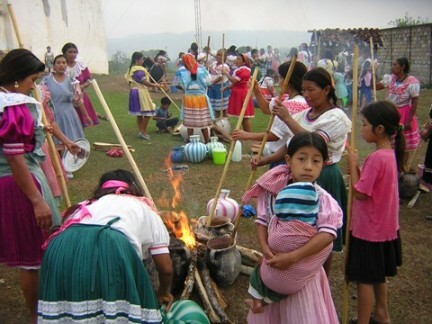 Examples of its work include a training program and assistance with marketing for beekeepers in Chiapas; various kinds of assistance for an indigenous women’s network of eight cooperatives that produce coffee, handicrafts and natural medicine; housing projects using appropriate technology that benefited hundreds of families in Chiapas, Guerrero and Oaxaca. Project description: The Mixteca Alta region of Oaxaca is an area where environmental degradation, extreme poverty, large-scale emigration, malnutrition, and disease are taking a heavy toll. The project funded Organic gardening training (ten workshops) and the creation of two model farming plots to improve family diet and food sovereignty with six groups of women/90 total, in three municipios (counties). Project activities also included public events to promote the importance of native corn and peasant trade fairs to promote fair trade within a solidarity economy model in four municipios. 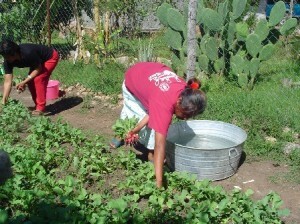 During the initial period of the project, significant progress was made in planning activities and in evaluating the organizational and training support needed by the six groups of women (90 total) participating in the project in the three municipalities of Santiago Nundiche, Santa Catarina Tayata,and San Cristobal Amoltepec. Participatory exercises were conducted on planning the technical and organizational training and support program with the 6 women’s groups to implement comprehensive backyard organic agricultural practices to improve health and nutrition. (municipal and communal land) in the development of a local agroecological training program and the creation of three public parcels for the production and promotion of corn, and the preservation of native seeds as a defense strategy for food sovereignty. In keeping with one of the main goals of the project, which was to strengthen the role of women in agroecological activities and involve the family in the tasks traditionally aimed at women, all activities have attained a high participation rate and involvement of women as a priority group.